Yes the LG G2 have some quirks and the software lags, the long pressing of the home button for example, or the scrolling in apps like Google+ and Chrome, isn’t as smooth as with the Sony Xperia Z1. It also has too much bloatware, almost in class with Samsung on that point. Sony is way better when it comes to that. Almost vanilla Android. The build quality on the LG G2 isn’t as top notch as the Xperia Z1 either, but I really like it anyways. It has awesome battery life (like the Xperia Z1), and it hasn’t so slow WiFi connecting times as the Xperia Z1 (there is something wrong with WiFi on the Xperia Z1, can wait for ages sometimes, and sometimes not), and one very important thing for me: video recording is much much better on the LG G2, and no audio problems when recording video either. So the built in microphones seems to be better on the LG G2. The Xperia Z1 has larger built in speakers at the bottom of the phone that sounds ok, the G2 has the speakers at the bottom too and is probably not as big behind the plastic speaker grill, but sounds surprisingly good anyways. A nice surprise really. I use it often to listen to books that are read out loud by Google’s text to speech service and the speakers works perfectly fine for that. Another very important difference is the display, the IPS display on the LG G2 beats the Sony Xperia Z1 display big-time. It’s way better. I realize that now, after using both phones in tandem. I really enjoy reading on the LG G2 screen, it’s a pleasure reading all the ebooks I read, and all the tech news too. Both when it comes to the great display and the weight and size of the phone. Love it. I have still not compared the cameras when it comes to shooting stills, but I have a hard time believing that the LG G2 camera will beat the awesome camera on the Xperia Z1. Even if the camera is really good on it, I took my first photo with the G2 from a theater this week (posted on my Google+), and my followers liked it a lot, so it’s definitely not a bad camera, and the video recording beats the Xperia Z1 as I said, and that is more important to me personally. I like the feeling of the phone even if its plastic, it doesn’t feel cheap as Samsung devices does. 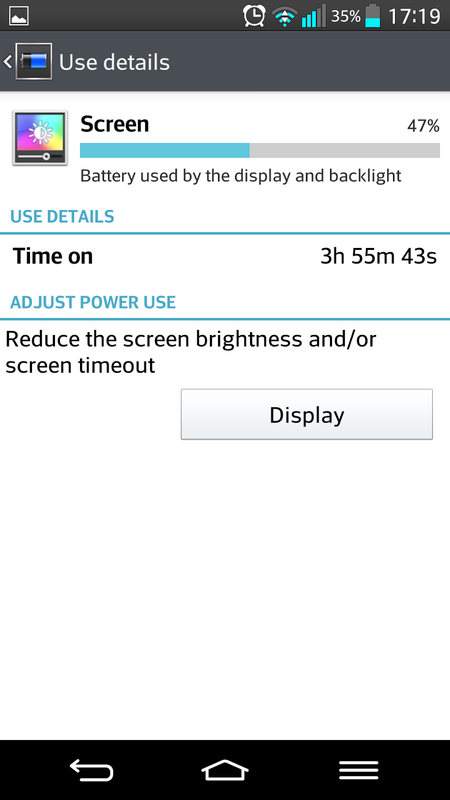 And it is so much lighter than the Xperia Z1, even as it has a larger screen and same powerful 3000mAh battery. And as I said in my first blog post about it, it’s so amazing that it can be so small with such huge display! I am already used to the buttons on the back and I really think that is a good place to have them. Too bad I lost the knock knock feature to turn off the screen when I installed the Google Experience Launcher. It still works to wake up the display though, but not to turn it off, and that is a drawback because I like that feature. The LG G2 also has some small details that I like, the clip tray that saves stuff you copy, silent mode with whitelist that actually works and some other things. 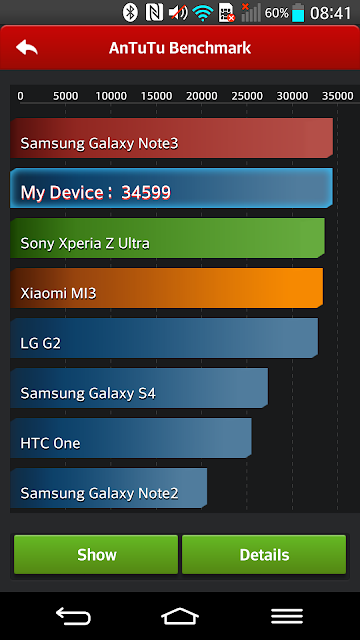 The LG G2 and the Sony Xperia Z1 has nearly identical AnTuTu benchmarks scores, both are very impressive. The top of the line this year. But yes believe it or not, I miss the waterproof feature that the Xperia Z1 has, not that I want to dive with it or something, but I feel safe using it out in the rain for example, and be able to washing it off with water is also nice. But I don*t miss the plastic port covers… They are very annoying. Check out the Android app Spotfinder!